I’ve been pursuing the best recipe for banana and other autumn-inspired bread loaf lately, hoping to concoct the best combination of spice and fruits / veggies to create the fluffiest loaf fit for this beautiful fall weather. I’m open to any combination, as long as the loaves do not contain white flour, white sugar and butter. I would like to someday create a recipe that are completely plant-based (no eggs) and oil free (perhaps replace the oil with apple sauce) but I’ll settle for the hybrid version of the old classic for now. I have a go-to banana bread recipe that I’m very happy with. It gives me wonderful results every time, so of course my logic is that if I substitute the mashed bananas with pureed pumpkin, I’ll be able to recreate the same, amazing result, right? The loaf came out more pumpkin pie filling than pumpkin bread, and since pumpkin puree doesn’t have the same sweetness ripe bananas naturally bring, the loaf lacked the cloying punch. Unfortunately, even the generous amount of chocolate chips weren’t enough to emulate the dessert-like sweetness. It wasn’t at all terrible and a big red “fail” stamp might be a little too harsh but this recipe definitely needs some fine-tuning. I go nuts for zucchini walnut breads. I still remember the first time I bit into one from Starbucks, which went ridiculously well with my cup of café soy misto during the long commute on the 101 freeway. It was incredible, but as in all good things, I had to bid farewell to it when I discovered that the seemingly innocent-looking muffin contained 28 grams of fat and 52 grams of carbohydrate (28 of them sugar). The muffin has been discontinued since, by the way. Anyway, my attempt to recreate my favorite loaf, bread, muffin, or whatever, was a big fat fail as well. I played around with flour to make it denser and increased the amount of maple syrup, etc. but the result wasn’t as extraordinary as the ones I remembered from the mega coffee joint. I’m really going to need to study up on the science of baking so I’ll be able to create the fool-proof version of this yummy delight! But I’ll get there. It’s true what they say – third time’s a charm! I just made some small tweaks to an already-delicious banana bread recipe, but those little things made a huge different in the finished loaf. I might have perfected the recipe for the best banana bread! 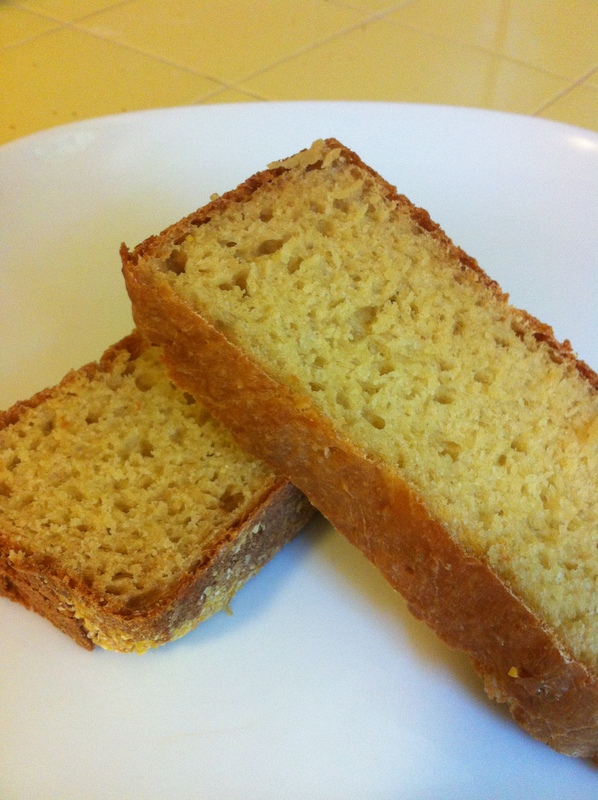 Here’s the 2.0 version of the banana bread (See other posts on banana breads here and here). I replaced the all-purpose flour with whole-wheat flour. I no longer keep the white flour at home. You can definitely taste the different but not enough to turn you off. I actually like the nuttiness of the whole-wheat more. I reduced the amount of flour from 1-3/4 cups to 1-1/4 cups. I changed the oil from canola to olive since that’s what I have in my pantry almost always. I blended the bananas in a Magic Bullet blender instead of mushing them with a fork. I initially did this because the bananas I was using weren’t as ripe and it was hard to mush them by hand. I think it resulted in a fluffier loaf. I also put the eggs, agave nectar, oil, vanilla extract, and cinnamon together in a blender. Again, I think this helped create an airy texture. If you have a large blender, you can mix everything, including bananas, together at once. I increased the amount of cinnamon from 1 teaspoon to 1 tablespoon. I just can’t get enough of the warm spiciness! I added ¼ cup each of milk chocolate chips, white chocolate chips, and coarsely chopped walnut. It’s no longer healthy banana bread but the combination makes the loaf so desert like and satisfying! 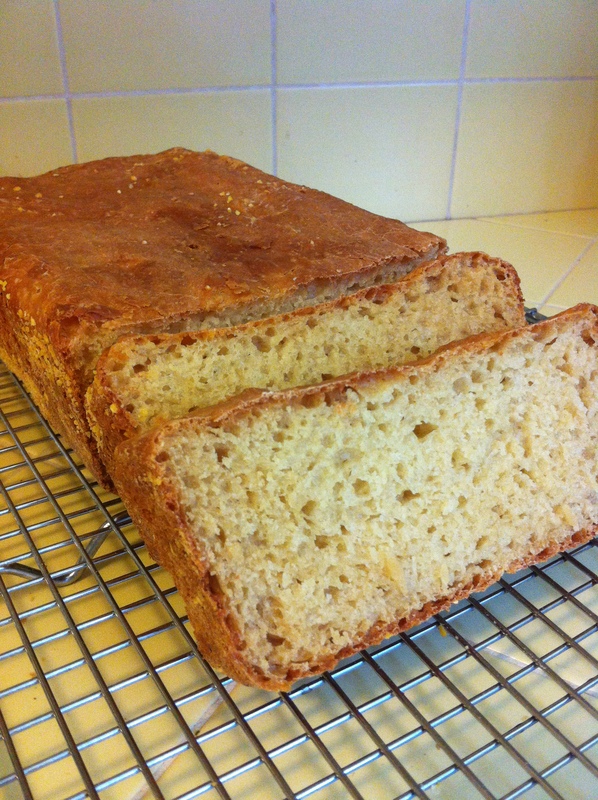 I slightly under-baked the bread for a less-dense texture. I’m loving this fall weather! I go through a major purging spree about three times a year. My first major overhaul took place last October, after I read this Japanese organizing book called “人生がときめく片づけの魔法” (Jinsei ga tokimeku katazuke no mahou) or “The Life-Changing Magic of Tidying.” (It’s translated into English and will be available in October 2014.) This book – that suggests that we should surround ourselves only with things that truly make us happy and bid farewell to the rest that no longer serve us — truly changed the way I look at things, as well as people in my life. The book helped me unload what feels like half of my belongings, including more than 10 large cardboard boxes full of cookbooks that I once considered as some of my most cherished possessions. While I was able to part with books that I once believed I could never live without with a surprising ease, there is one book that always manage to hang on! It’s a cookbook / tea guide / memoir (the real classification of this book remains a mystery) written by musician Moby and his then girlfriend Kelly Tisdale titled Teany Book. I’m not a fan of Moby (in fact, I’ve never heard his music) but I love teas, and I’m addicted to collecting delicious vegan recipes. I think this book is worth picking up, just for Teany’s Top Secret Chili recipe. I recreated this delicious meat-free chili last night, and the result was as amazing as the one I tasted in the Lower Manhattan tea house. The secret: coco powder, cashew nuts, and espresso! I reduced the amount of garlic (1/4 cup seemed a bit too excessive), omitted seitan (because I didn’t have it on hand) and added one zucchini, but followed the recipe for the rest. (You can find the recipe by clicking here). I’m so in love with this healthy version of the classic comfort food, this will surely become a staple at our house! I served the bowl with a dollop of yogurt, avocado chunks, and a splash of Tabasco, which made it even more delicious. I’m hardly the first person to try the homemade laundry detergent (I can easily be the last) but I recently put it to the test and found that it works great! The strong, nose-twisting scent of Fels-Naptha soaps overwhelmed me at first (okay, it’s not that bad), but I was happy to find that the smell goes away after a wash, leaving clothes with a clean and crisp feel. I don’t know which site(s) to attribute the recipe to because everyone pretty much offers the same combination of washing soda, Borax, baking soda, and Fels-Naptha soaps, just in different amounts. Some adds color booster (like Oxy Clean) and fabric softener, but I just stuck with the basic. Here’s my version of the ever-so-popular homemade laundry detergent! Grate Fels-Naptha soap bars with cheese grater (I ran them through food processor afterward for finer grate). Pour in Borax, Washing Soda, Baking Soda, and grated soaps in a jar (I used one gallon cracker jar) and mix well. Use 2-4 tablespoons per load. I developed a culinary crush on Melissa D’Arabian back in 2009 when she won the Next Food Network Star with her down to earth and wallet friendly menus, with a dash of her tenacious spirit. Then I cancelled cable and we went our separate ways … until we reunited when I purchased her cookbook, Ten Dollar Dinners! I love buying cookbooks but I rarely cook from them (I read them like a literature), but this one is different. All the recipes look delectable and approachable. They are the culinary version of a girl next door – non-assuming and accessible– just like Melissa herself. My first attempt from the cookbook: Orange Carrot Soup (you can find the recipe on the FN website, under the name, Orange-Scented Soup). The soup is infused with orange zest, which gives this lovely earthy soup a special twist. I used a lemon zest instead but it was still very lovely. My husband enjoyed it too, and this will surely become a go-to soup in chilly fall / winter nights. And yes, the soup cost next to nothing, delivering on her promise. We paired the soup with Salade Nicoise with Lemon-Thyme Vinaigerette (p.93) from the cookbook for dinner. In a medium saucepan, heat the olive oil over medium heat. Add the carrots and the onion and sweat until the mixture starts to soften, about 5 minutes. Add the garlic, orange zest and oregano and cook until fragrant, another 1 to 2 minutes. Raise the heat and deglaze the pan with white wine. Add the stock and water. Bring to a boil and reduce to a simmer. Cook until the carrots are tender, about 8 to 10 minutes. Cool the mixture for about 5 minutes before processing. Process the soup in a food processor or blender until smooth. Season with salt and pepper, to taste. Pour into serving bowls and swirl in a heaping teaspoon of sour cream before serving. I spent a wonderful afternoon with my friend D who I call the future mother-in-law for Pon Pon. She has an adorable son born just two weeks after our daughter and we are hoping that they’ll get married when they grow up. On the way home, Pon Pon and I took a field trip to Whole Foods Market in Pasadena. A trip to this giant farmer’s market for mommy is like a trip to Disneyland for kids — it’s an ultimate adventure. I think she knew this because she slept in her stroller the entire two hours that we were there and gave me the freedom to roam through each aisle for unique finds (LOVE her). This particular Whole Foods is pumped on steroid, a two-story affair packed with amazing things you never knew we needed but you suddenly can’t live without, like organic leeks. I brought home two stalks of these green onion-looking vegetable (among few other items which cost me $100) and made leek and potato soup for dinner. Saute the leeks and potatoes with olive oil in a large saucepan over medium heat until the leeks become translucent. Add water and bring to boil. Let it simmer for about 5 minutes. Turn the heat to medium low. Using an immersion hand blender, puree the vegetables until completely smooth. If you don’t have a hand blender, you can use the regular kind. Be careful, as the liquid is piping hot. Reduce the heat to low and add milk. Add salt and pepper to taste. Optional: Since this recipe doesn’t use cream, the soup is a little on the smooth size … but you can use flour to thicken the soup, if you like. Simply temper the flour by adding a ladle-full of hot liquid to it and stir. Stir quickly and make sure to get rid of all lumps. Add the liquid back into the soup slowly while stirring. The soup should thicken up a bit after a few minutes. Sprinkle chopped onion before serving. Serve with crusty baguette or a roll (recipe follows). Combine the sugar, salt and water in a bowl, and stir until everything is dissolved. Add the flour and dry yeast and mix with hands. When the mixture thickens a bit (and not too watery), pound it on the side of the bowl until you’re able to form a dough. 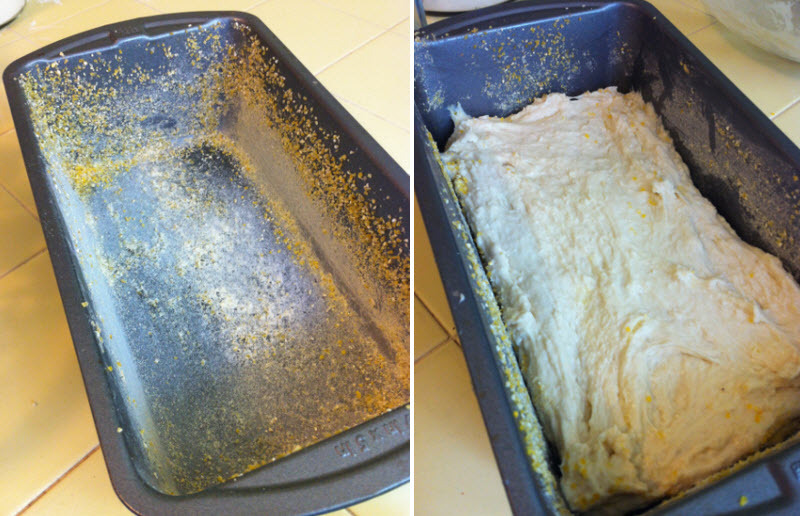 Take the dough out of the bowl and knead it on a floured kneading board for about 10 minutes. Rub butter onto the dough. Fold the dough and slap it onto the kneading board. Repeat several times. Put the dough in a greased bowl and cover with a plastic wrap. Let it rest, until the dough doubles in size, about an hour. Insert a finger into the dough. If the hole closes up, you need to let it rest a little longer. Release the gas by pushing down on the dough. Divide the dough into six portions using a pastry cutter or a knife. Roll each dough into a ball and line them on a floured surface. Cover with plastic wrap and let them rest for about 25 minutes. Insert a finger into the dough. If the hole closes up, you need to let it rest a little longer. Roll each dough into a ball again and line them on a baking pan, an inch apart. Bake at 390 degree F for about 15 minutes until golden brown. Okay, I will admit – these finished rolls aren’t supposed to look like this. They were supposed to have a lovely golden brown crust … but instead, I got these pale-looking things. I was so bummed when my rolls didn’t brown properly, and they became as hard as a hockey puck! I still haven’t figured out why that happened, but I’m going to try this recipe again to troubleshoot! Other than the outside, the rolls came out pretty good! Once you slice into it, the crust was perfectly chewy and the inside pleasantly moist.